Thinking 2011: USD to decline further in Q1 then? I’m a non-professional currency speculator who has been successful in making overall correct bets in 2009 and 2010, or as far as this blog recorded. I’m an ordinary being who do not predict the future correctly. Yet, I’d prefer proposing the hypotheses on the short, mid, and long term market fluctuations before betting my p0recious capital (knowing it would probably turn out to be wrong). When I took positions, I’ve been most successful in crafting the entering and exiting strategy that spans for a few days to a week. I assume I make mistakes a lot, and I did in fact. But I hope that I will make up the mistakes by more winning bets, and I’ve been profitable in that way so far. But there is no guarantee in the future. So, I’m always conservative in the size of the position. I look at various charts of stocks, currencies, and commodities. I’m not a professional trader, so I have constraints in what I can trade. It is not legally safe for me to trade the stocks of companies which have direct business to my day job. So, in general, I prefer to trade currencies and indices. I use a bit exotic technical analysis called Elliott wave principle to decide when to buy and sell. I wrote some introductory articles and there are much better textbooks than my writings, but it seems many people find this method a little complicated and hard to use practically. Some other people think it’s even flawed in logic. How other people think of the method is not my concern, and I use it because it’s been saving me from losing money. I see the price fluctuations as the combinations of waves of various size and frequencies. 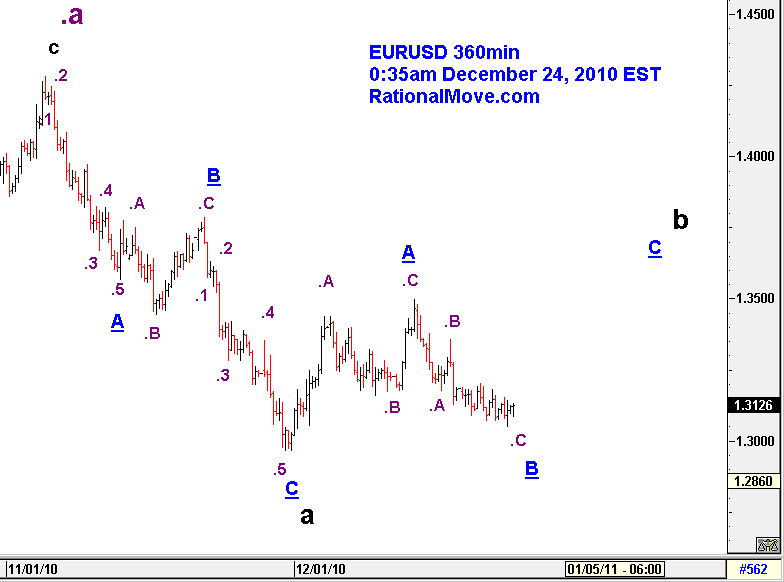 The labels I put in the charts on this blog is the counting of the waves based on the rules of Elliott wave. It is not a science, and there are often multiple ways of counting the waves, and many counts get rejected as the future price actions unfolds. I also could make mistakes in following the Elliott wave rules in counting waves, but I try not to. Either way, I often erase the past labels, and update the count in the most plausible way as of present. So goes the first chart. This is a weekly chart of EURUSD. I think we are in the rally towards b that may reach or go higher than 1.3600 in Q1 of 2011. 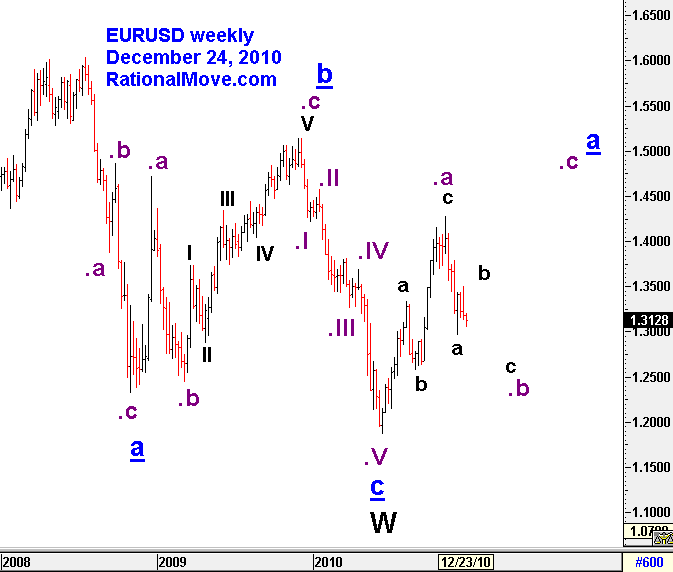 Then EURUSD will have a decline towards c that concludes .b wave in the latter half of 2011. My current view anticipates a big rally after that, but that is too far away to concern for my short term trades. These charts were saved December 24, so it does not capture today’s spike of the EURUSD towards 1.3250 (as of now). 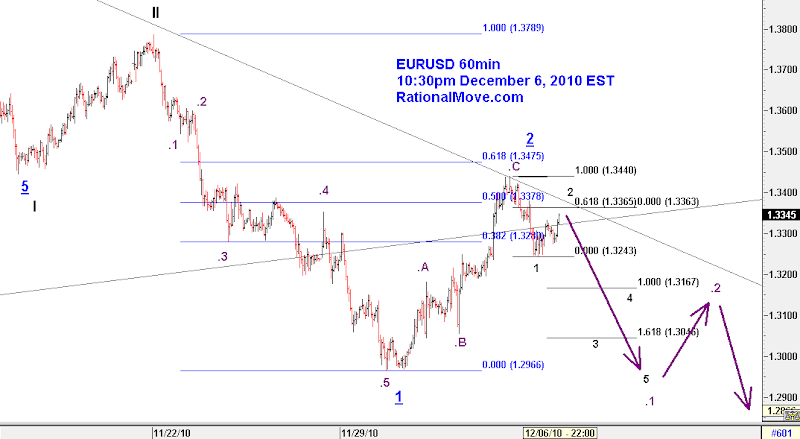 I’m interested in being long EURUSD for a short period towards C that concludes b as in the 6 hour chart below. That may become my first trade in 2011. 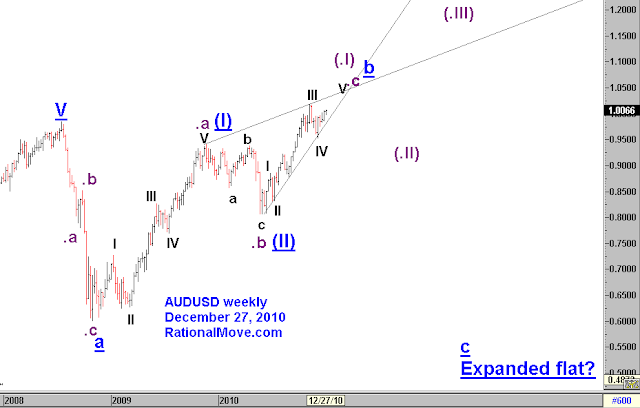 Now to AUDUSD weekly chart. My 1st scenario in this mid term forecast is as labeled a, b, and c, and it is more bearish for Aussie. The 2nd scenario is labeled with (I), (II), and (.I), (.II), (.III) that are actually sub-waves of (III). 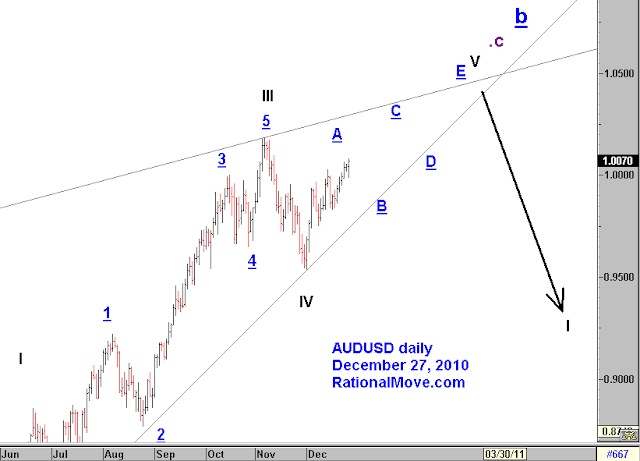 Though those views are completely split in the mid term, I would think AUD go higher against USD in Q1 of 2011, then see a either bigger (i.e. the 1st scenario) or smaller (the 2nd scenario) decline afterwards. If I zoom up to daily chart, the current uptrend so far is not what Elliott wave calls an impulse, and possibly making an ending diagonal wave that is a reversal sign. So, I will rather observe during Q1, and if I see a sharp decline, I will start crafting the strategy of selling short AUDUSD. 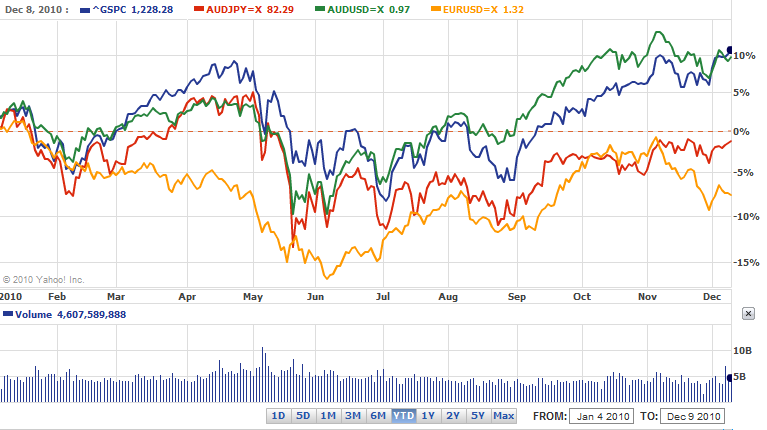 So, overall, I am anticipating USD to decline against EUR and AUD in Q1. I’d buy EURUSD than AUDUSD because EURUSD was oversold in the short-term; it may see a short-cover and Aussie was bought significantly already. But I’d be prepared for US dollar to get strength in Q2. That is negative for EUR and AUD. If the strength of USD is indeed the sign of “risk off”, stocks and commodities will also see a substantial decline in Q2 and later in 2011. That is my view for the time being. Rational Move made 12.1% on short term trade. I also made 2% on mid term trade that was not accounted into the short term trade. So, total capital growth is about over 14%. The next graph is performance by month. 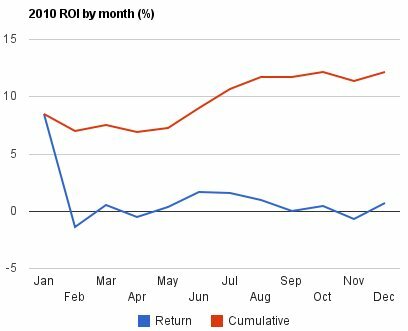 I made most of the return in January (8.47%), and made a gradual growth later on. Down moths were 3 out of 12 (February, April, and November). 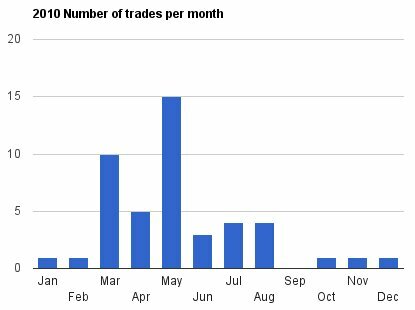 The next graph is the number of trades by month. The total number of trades was 46, and 35 of them were from March and May only. I think I try to catch a potential big wave after the flash crash of May only to see such move did not happen. After that, I decided to be selective in taking positions, and the number of trades reduced very much. The number of winning trades were 31 and losing trade was 15. The wining rate was 67.4%. I believe this number is higher than the last year, thanks to selectiveness in taking positions. The last graph is the drawdowns of the last 100 trades. So latter half of the graph represents the drowdowns of 2010. I clearly learned from the lessons from 2009, and stabilized capital from the over fluctuation. 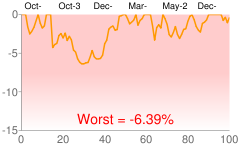 This year’s worst was -3.31%. Though I do not have a record at hand, I think I kept my bet size small; the maximum exposure I took was lower than 2.5%. Here, what I mean by exposure is the capital loss (%) when the stop loss is triggered. This year (again), I was anticipating really a big crash – a crash that would have been much bigger than flash crash of May. So, when I thought it was coming, I did not book profit even when I had 400 pips unrealized profit per lot. After the fact thought is that I should have taken at least a partial profit if I could for the slightly better annual return…I need more capital to be able to be flexible in operation to be honest. First of all, I have to correct (again!) my Elliott wave labeling. The black 1, 2… I was re-labeling was actually I, II, … all that matters is that the waves of this cycle is the legs that can be observed in daily chart and labeling convention is not essential. My current plan is to increase the short position at 1.3234 or the break down of 1. I may take a partial profit at .1, and wait for .2 to appear and sell more on the break down of .1. That is the ideal scenario.